Southampton beat Aston Villa 6-1 at the St Mary’s Stadium in a one-sided encounter which featured a 3-minute hat-trick by Sadio Mane. The Senegalese winger scored the fastest Premier League hat-trick with his goals coming in the 13th, 14th and 15th minutes of the game. Southampton gifted Villa an opportunity in the 1st minute, when Toby Alderweireld’s misplaced pass found Christian Benteke but the Belgian striker couldn’t take advantage of the mistake. Graziano Pelle thought he took the lead in the 4th minute but his goal was ruled offside by the linesman even though replays showed that he was in fact on side. The Saints dominated the early exchanges but Villa did have an opportunity to score early on. Some nice interplay from Villa in the 12th minute led to Fabian Delph playing in Benteke but the in-form striker side footed the ball wide. Villa would rue that miss as Southampton took the lead in the 13th minute through Sadio Mane, who ran onto a Pelle flick before firing in the opening goal. Mane would score his second goal a minute later after a poor back pass from Ron Vlaar was intercepted by Pelle and the ball landed at the feet of Mane, who put the ball into an open net. But the Senegalese winger was not yet done as a minute later he would grab a remarkable hat-trick goal, when he beat Villa goalkeeper Shay Given with a wonderful first time finish. It was a record breaking hat-trick, with Mane’s 3 goals coming in less than 3 minutes. Mane would soon be in the thick of things once again as he played in Pelle with a beautiful defence-splitting pass and the striker’s shot was first saved by Given but the rebound fell kindly to Shane Long, who put the ball into the back of the net. Villa were deflated but Southampton were not letting up and continued to force them into mistakes and in the 39th minute Shane Long scored a wonder goal. Long dispossessed Ashley Westwood in the middle of the park before spotting Given off his line and hit a fantastic long range shot, which went over the goalkeepers head and into the net. It was a goal that emphasised the gulf in class of the two teams on the day. Villa did however grab a goal just before the half time break, when Benteke headed in a Leandro Bacuna cross. Southampton took a 5-1 lead into the break and a comeback seemed highly unlikely for Villa. 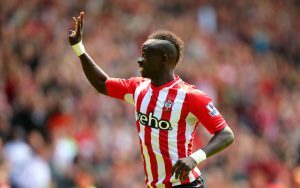 The second half was less eventful and saw Southampton score only one more goal, when Pelle finished off a Sadio Mane cross. The goal capped off a remarkable performance by Mane, who was involved in all but one of the goals. The result sees Southampton consolidate 7th position on the log, while Aston Villa will be searching for a morale booster ahead of the their FA Cup final clash with Arsenal.